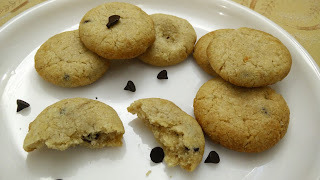 Why to eat refined flour (Maida) cookies when whole wheat flour cookies are so simple to make and that too eggless!!! Healthy cookies which can be stored for long. In a bowl, mix flour, baking powder and butter with help of finger tips to get bread crumbs like material. Add sugar, choco chips and make dough using little milk. The dough should be firm and soft. Keep the dough in refrigerator for 15-20 mins. Once the dough is firm, make small balls and flatten them to make cookies. Cookie cutter can also be used instead. Glaze the cookies with little milk on top and put it in preheated air fryer for 10 min at 160 degrees. Once 10 min are over, give standby time for another 10 min and allow the cookies to cool. Cookies are then ready to serve. Store in airtight container.